With the heavy duty Semi-Metallic Friction Formulation, SEM ensures vehicle to stop safely. 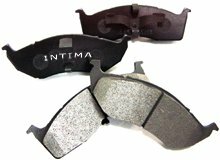 It protects the brake system from overheat and fade by reducing heat transfer through the pad. Its noise-decreasing characteristic always keeps vehicle quiet while braking. Range from light to heavy-duty vehicles,Passenger cars and light trucks,Sport Utility Vehicle.